It seems like a natural tendency. New sailors, old sailors and everyone in between all seem to want to go a little faster. Or more accurately, a little faster than the other, nearby boats. Long ago, some observant sailors noticed this need for speed and created what has evolved into modern sailboat racing. Going faster is just the beginning. Successful sailboat racing requires tactics, strategy, keen observation and more than a little luck. 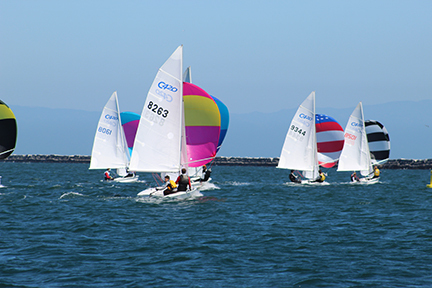 Blue Pacific Yachting offers sailboat racing classes and sailboat racing opportunities in Marina del Rey and beyond. Take a BPY racing class and there’s a strong possibility you will soon qualify for membership in the Blue Pacific Racing Team. There’s no better way to get those competitive juices flowing while testing your skills against other sailors. Learn to race with Blue Pacific Yachting and you can race anywhere in the world.